The Alumni Spotlight is an interview series where we interview Asia Studies alumni about their career paths, how they became interested in Asian Studies and for any advice that would be useful to our students. This interview features Ciaran Dudley, BA ’11. Mr. Dudley currently works in Vancouver as an Information and Culture Officer at the Consulate General of Japan. 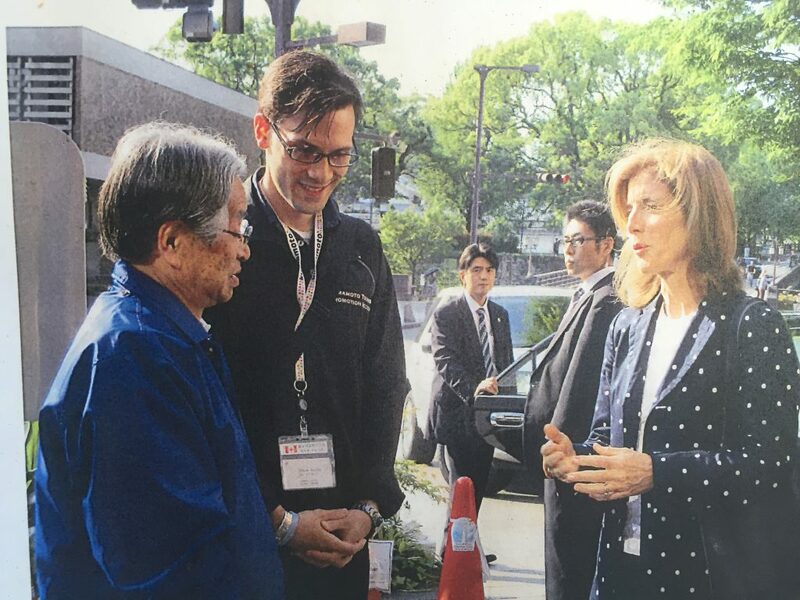 Ciaran (centre) interpreting for US Ambassador to Japan, Caroline Kennedy, following the Great Kumamoto Earthquake. Hello, fellow Asian Studies studiers. My name is Ciaran Dudley, I am a 2011 UBC Asian Studies BA graduate, currently working as an ‘Information & Cultural Officer’ at the Consulate General of Japan in Vancouver. I became interested in Asian Studies when I discovered that one could pursue a legitimate academic career studying Japan—a country and culture which I had been curious about since high school. It is hard to pinpoint exactly what sparked my interest, but suffice it to say that Japan as a whole offered a certain ‘allure’ to my undergraduate eyes. This might sound somewhat orientalist today, but that was my thought process at the time. Japan appeared almost magical to me. I can’t recall having had any kind of precise strategy as an undergraduate. As far as recommendations go, I would say that it would probably be best not to concern oneself too much with ‘getting ahead,’ and instead simply immersing oneself in one’s chosen subject of study. In education, as in all else, the end does not justify the means. If anything, it is the means that justify the end; for the end is the means of the means. In other words, the learning is just as important as the knowing! How did your goals or plans change during your studies or once you had started your career? The further I advanced in my courses and later in my career, the more it dawned on me that mastery of any kind would be out of the question until I came to terms with the fact that I was going to remain an absolute beginner all my life. So, I suppose career experience forces one to rethink one’s expectations and become more open to dealing with the details of concrete reality in all its glory, as opposed to the abstract premature dreams of expectant and impatient youth. Upon graduating, I immediately applied to the JET Programme to become a Coordinator for International Relations (CIR) with the Government of Japan. Luckily, I was one of the two CIRs accepted that year and was sent to work as a translator, interpreter, and presenter at City Hall in Kumamoto, a mid-sized city on the southern island of Kyushu, Japan. 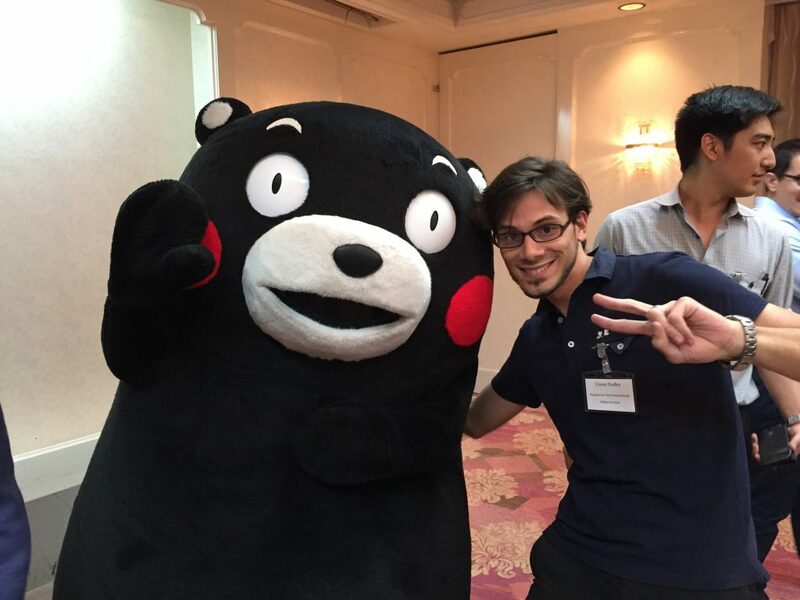 Ciaran with Kumamon at the prefectural office in Kumamoto, Japan. The transition from student life to the professional workaday calendar was predictably jarring, but my sheer excitement about living and working in Japan absorbed much of the shock of my otherwise abrupt foray into the arena of adulthood. Of course, in hindsight the transition looks like it was simple and clean, but in the heat of the moment it felt very complicated and messy. After working as a CIR in Kumamoto for four years, I returned to Vancouver and was lucky enough to be hired right away by the Consulate General of Japan where I am currently employed today. My primary duties include: running school workshops; event coordinating; website maintenance; tourism inquiries; translation; and screening grant applications for the Japan Foundation; as well as social media odds and ends. 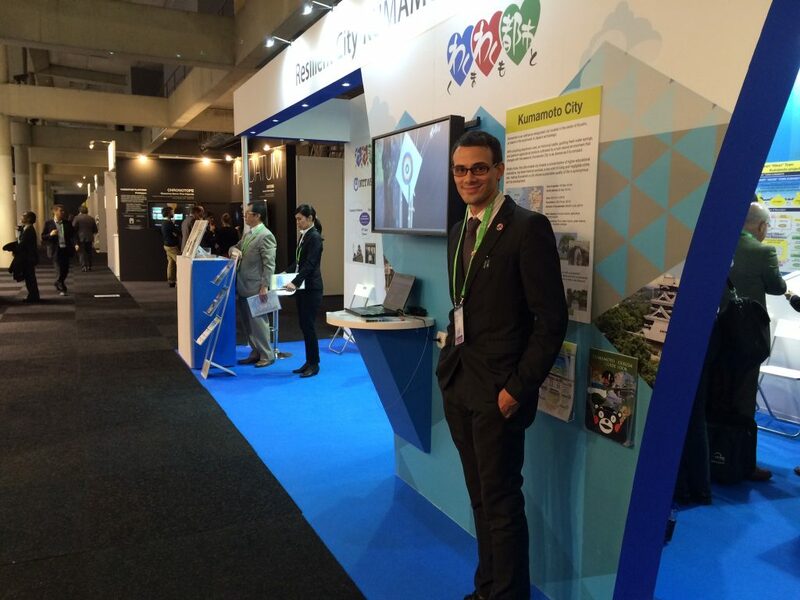 Representing Kumamoto city at a sustainability conference in Barcelona, Spain. At the end of the day, I would have to say that being able to both directly and indirectly maintain and build upon the relationship between Canada and Japan from ‘behind the scenes’ as it were, continues to be very rewarding. It’s like being on the movie set of the political world in a way. Government offices are always on the lookout for ‘foreigners’ who are well-versed in Japan. And now with the 2020 Tokyo Summer Olympics fast approaching, I would definitely keep my eyes open for employment and/or internship opportunities in the near future. I do not think that I could describe a ‘typical entry-level position’ in this industry, but it would most likely require someone with a more or less conscientious yet flexible character who can adapt to changing circumstances and is at least moderately familiar with the basics of the Japanese language and culture. Learning an Asian language hasn’t only helped me in my personal and professional life, it has single-handedly sustained me through these experiences. My ability to speak, read, and write Japanese (in however mediocre a manner) has unlocked countless opportunities that would have otherwise been off-limits. The philosopher Wittgenstein said that ‘the limits of our language are the limits of our world,’ and I take this to mean that if we learn another language, we actually come to ‘limit the limitation’ of our world itself, and thereby expand the world for ourselves. Learning Japanese has allowed me to overstep the particularities of English and its correspondingly particular worldview. I can now appreciate things from another, more Japanese point of view and hopefully this means that I can see the world more fully, or what is the same thing, less partially, and thereby make myself useful to more and different kinds of people. What advice would you give to yourself as an undergrad or recent graduate? Don’t be afraid of failure, especially at the beginning. Sooner or later, you’ll be such an expert at failing that you’ll start to fail at failing itself. 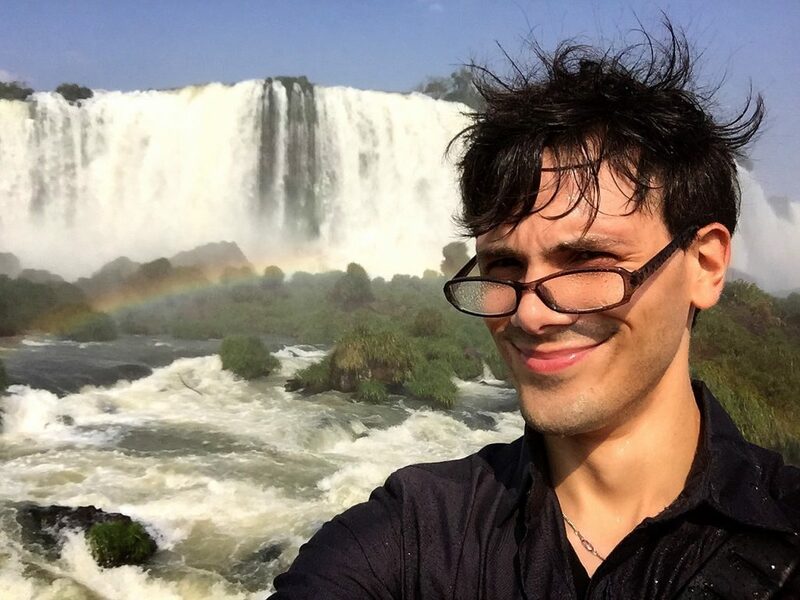 Ciaran at a water cultivation conference at at Iguaçu Falls, Brazil.